Misty has provided her Weiman Stainless Steel Cleaner and Polish review, explaining how it has worked for cleaning her stainless steel appliances. Using a cleaner specially formulated for cleaning stainless steel is important to me. While I have never tried cleaning my appliances with anything else, I have accidentally sprayed or wiped other cleaners on my stainless steel, and it looked streaky. I am very pleased with the performance of Weiman Stainless Steel Cleaner. I bought the aerosol can, with a thick formula that stays where you spray. In my opinion, it is like furniture polish for your stainless steel surfaces. I spray it on one half of each refrigerator door at one time, then rub with a soft cloth using a circular motion. I also use it on my stainless steel microwave and oven. It has never streaked, or damaged my appliances in any way. While I have never had to clean any major stains, it does very well at removing smudges and fingerprints. The fingerprint-resistant formula must work very well, because I rarely have to use it. For around $6.00 for 12 ounces, it is a fantastic value, considering one can has lasted well over a year. As a bonus, the smell of this product is fantastic! It does not say anywhere on the label what it is, but it has a fresh, powdery scent. I love how it not only gives my stainless steel a super sheen, but also makes my whole kitchen smell clean. 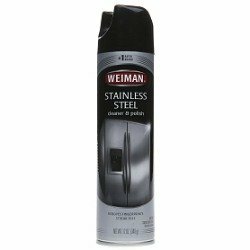 Thanks for sharing your Weiman Stainless Steel Cleaner & Polish review Misty. I have heard from many owners of stainless steel appliances that they were not aware of how many fingerprints and smudges these things would accumulate, and found this part of owning stainless steel frustrating. Thanks for sharing how you've fixed this issue in your home with us. Has anyone else used this, or another cleaner formulated for cleaning stainless steel in their homes? If so, you can share your stainless steel cleaners review here, or read other reviews that have already been submitted. Join in and write your own page! It's easy to do. How? Simply click here to return to stainless steel cleaners.